There are some trips that work best as unplanned, spontaneous adventures, but trekking to Everest Base Camp isn’t one of them. We did some serious planning for our epic hike and spent hours researching gear, routes and costs before we even set foot in Nepal. As we wanted to trek independently without a porter, we knew we’d have to carry every item on our backs, each painful step of the way. So what did we take with us? 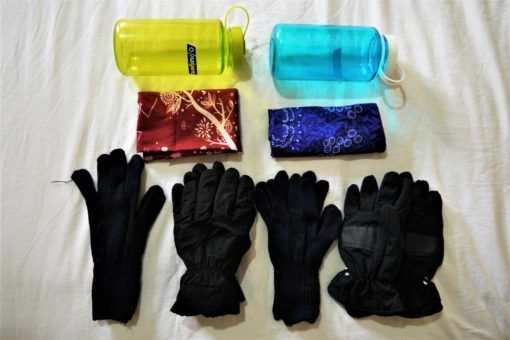 Here’s a look at our Everest Base Camp Packing list. 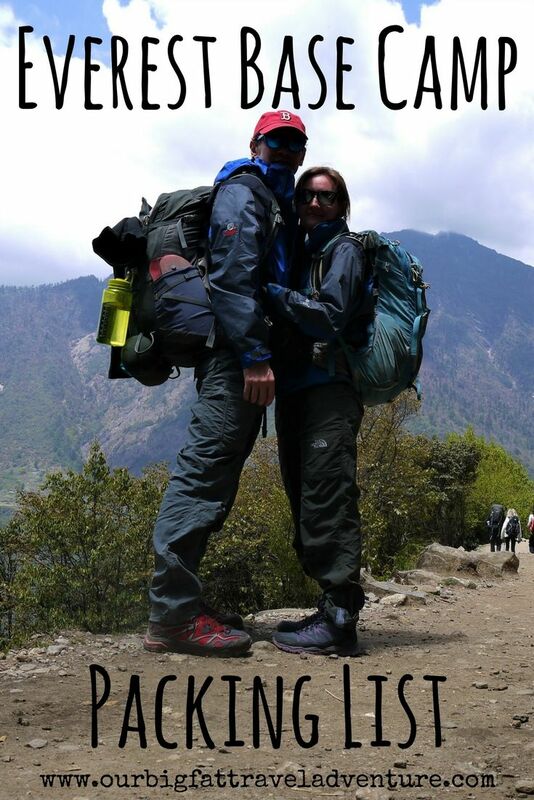 • World Nomads travel insurance – our basic policy didn’t cover trekking up to 6,000 metres, so we bought extra cover for £87 each and took a hard copy of our policy documents with us. • Trekkers Information Management System (TIMS) Card – this cost £14.92 (2,000 Nepal Rupees NPR) per person. There were checkpoints along the trail where we had to get these cards stamped. 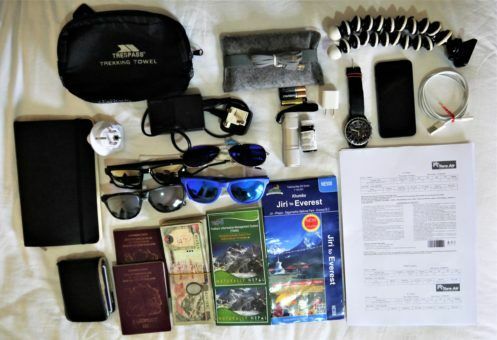 • Sagarmatha (Everest) National Park Entry Permit – which cost £25.35 (3,400NPR) each. There was a separate desk at the office to get permits for trekking the Annapurna Circuit. 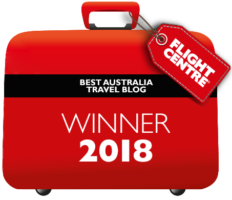 • Return Tara Air flights from Kathmandu to Lukla – we chose to fly to Lukla, the popular starting point of the trek, so we booked tickets online beforehand and printed our confirmations. Flights cost £114 per person each way. 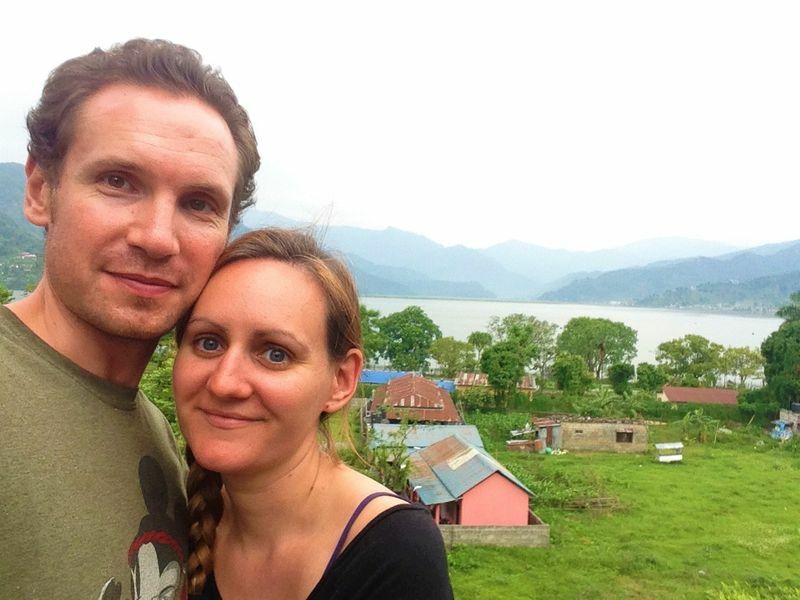 • Passport and copies – rather than leave our passports in Kathmandu with our excess luggage, we chose to take them and a copy of the photo page with us. • Cash – Although there are ATMs in Lukla and Namche Bazaar, we made sure we withdrew enough cash in Kathmandu to cover us for the trek. • Buffs – useful as head scarves and face masks to protect against the cold, dust and fierce sun. • Socks – three pairs each, plus an extra pair of bed socks for Amy. • Underwear – five pairs each. 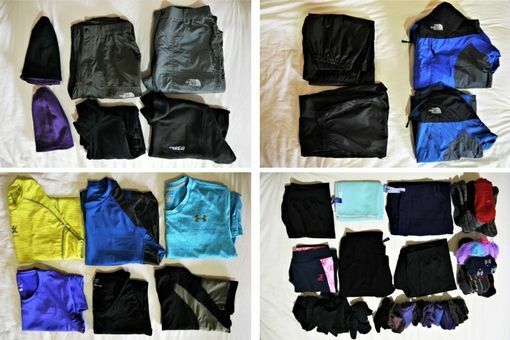 • Trekking trousers – one pair each. • Shorts – one pair for Andrew. • Thermals and yoga pants – one pair of thermal leggings each and yoga pants for Amy. • Long-sleeved base layer – one each. • T-shirts – two each, some moisture wicking. • Fleece – one each. • Waterproof trousers – one pair each, essential for the days when we walked in rain and snow. • Raincoats – we had rain, snow and hail on the trek, so these were essential. • Down jackets – rented for 50NPR each per day from Shona’s and essential for the minus five temperatures we faced further up on the trail. • Hats – one thermal hat each plus Andrew’s baseball cap. • Gloves – one thin liner pair and one thick pair each. 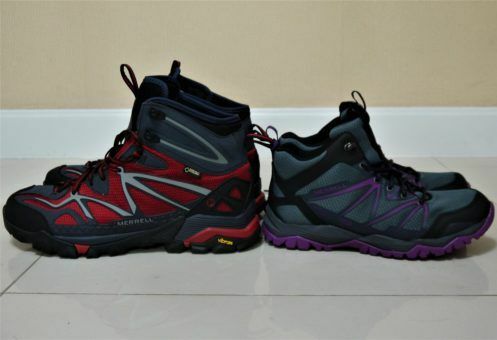 • Trekking boots – one pair each of Merrell Capras bought in Chiang Mai. • Trainers and flip flops – Amy used a light pair of trainers and Andrew used his flip flops with socks in the tea houses in the evenings. • -15 sleeping bag – for Amy, rented from Shona’s for 100NPR per day. • -10 sleeping bag – for Andrew, rented from Shona’s for 80NPR per day. 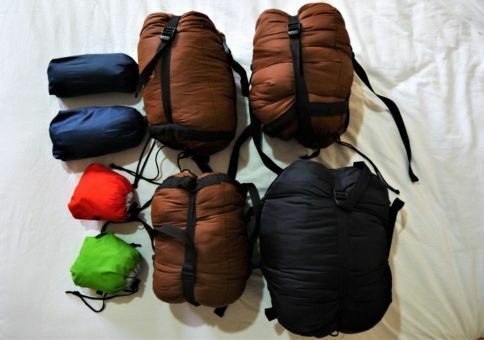 • Sleeping bag liners – cotton, one each. • Backpack rain covers – one each. • Everest Base Camp map. • Water purification tablets – we used these occasionally, but mostly bought boiled or UV sterilised water from tea houses. • Water bottles – one each. • Sim card – with 1gb data for 600NPR. Wifi can be expensive on the trek, so we used data on our phone to check emails occasionally when we had reception. • Sunglasses – two pairs each in-case one broke, the sun is incredibly strong at that height. • Playing cards – for the evenings as we had no laptops or kindles with us. • Trekking poles – we picked these up in Namche Bazaar to help with steep parts of the trek. • Sun cream – we somehow forgot to pack this and the sun was so strong we had to buy some expensive factor 50 in Namche Bazaar. • Contact lenses, solution, case and spare lenses. • Toilet roll – this costs more the further up you trek, so we took a supply with us. • Baby wipes – hot showers are also expensive on the EBC trek costing around £3-5. Higher up it’s also just too cold to contemplate washing, so we had just two showers during our two-week hike, the rest of the time we simply used baby wipes. • Ibuprofren – essential for dealing with altitude headaches. • Diamox – this medicine can help with altitude sickness and we met many trekkers using it as a preventative measure. When we visited the Himalayan Rescue Association, the doctors confirmed that Diamox has been proven to reduce altitude sickness. However, plenty of trekkers don’t take Diamox and are perfectly fine. We picked up a small supply in Namche Bazaar which we attempted to use higher up the trail. For Amy, the side-effects of a tingling face, hands and feet were too unpleasant as they resembled the on-set of a migraine, and we both stopped taking them until Gorak Shep, when the altitude sickness got really bad. 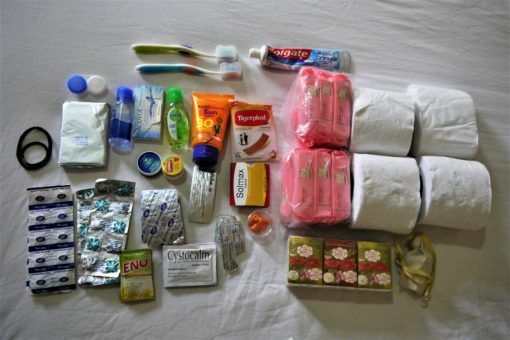 • Cystitis medicine – a cystitis attack would be hell while trekking so Amy took this medicine just in case. Luckily she didn’t need it, but we did give some of this to a French girl who was in severe pain with a bladder infection. • Migraine tablets – Amy suffers from occasional migraines, which can be triggered by high altitudes. • Plasters – even if you have well-worn shoes, trekking everyday can really mess up your feet. Amy had blisters and a black toenail during our trek. • Rehydration salts – we barely used these and could have gone without. • Hand Santitiser – this was essential for emergency toilet stops and places we stayed in Lobouche and Gorak Shep with no running water. • Strepsils – useful for treating dry trekkers cough. • Vicks – was barely used this and could have been left behind. • Carmex – essential as the cold, dry weather left us with really chapped lips. • Eyemask and earplugs – a lifesaver in the flimsy, noisy tea houses. 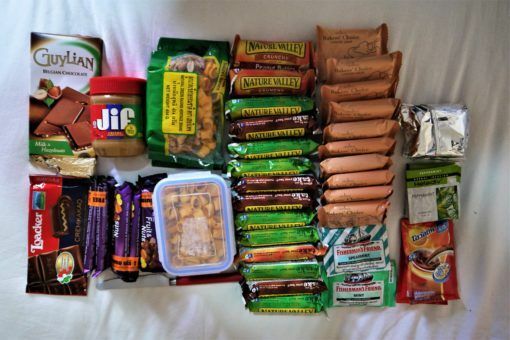 To lighten our load we left the peanut butter, some crackers, chocolate and the box of trail mix behind. • Iphone 5 and charger. • Two adapters – we could have just taken our SKross. • Power bar – bought off the market in Chiang Mai, this was great for minimising expensive charging costs along the trail. • Torch and spare batteries – a good idea for night time toilet runs when there’s no power. • Camera and charger with four memory cards (48Gb total). We packed everything in our usual Osprey 35 litre travel backpacks, which weighed a total of 15-17kg. Although we packed the bare minimum, carrying our bags still felt tough, especially as we reached higher altitudes. So, if you’re unsure whether you can manage independently, hire a porter for 1,500 – 2,500NPR per day. Just make sure they’re insured and have the right gear for the trek. Still to come: our Everest Base Camp route, vlogs and cost breakdown. If you have any questions about the trek, ask away in the comments below or let us know what you’re essential trekking items are. Hi Gilda, yes, there’s quite a bit to organise. I would definitely recommend getting a supply of Diamox, I’m glad we had it even if I didn’t use it all the time. 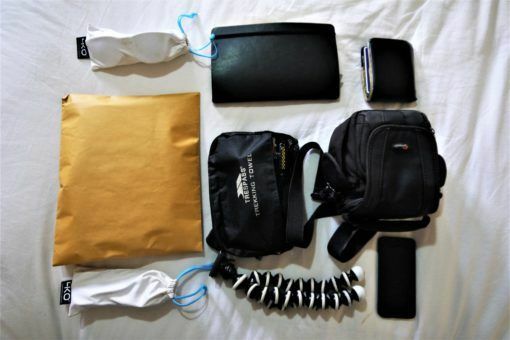 A porter is a good idea too, carrying your own stuff can be hellish!